See that break in activity between December 2015 and June 2018? That represents my transition from one-course-per-semester coursework to candidacy exam, prospectus writing and defense, and dissertation work. I’m not a consistent blogger. Most of the posts to this blog came from requirements or expectations of graduate coursework. Why the burst of activity? It’s about the job market. I’m building a professional site that reflects who I am as an academic researcher, scholar, and teacher. I want to put my best persona forward, but I’ll admit, consistent blogging is hard for me. Doesn’t make it less important, just a reflection on the challenge it presents. It’s not that I don’t write. Doctoral candidates don’t “not write.” We write emails, we write feedback on papers, we write grant applications, we write dissertations, we write positions, and we write publications. I’m writing all those things. I’ve posted drafts of my nascent teaching philosophy and research statement to represent that writing work, but so much writing is done behind the scenes, out of the public’s sight. I’m struggling through the labor of writing my dissertation, and it turns out that a blog post is a useful distraction from that labor. But it’s also true that I’m working on finishing touches on the initial draft of my first chapter, that I’m about halfway through my review of literature, that I’ve written up one set of methods and results my pilot study, that I have completed most of my data analysis for my final results. I’ll be writing six total chapters, one more than a “standard” dissertation (whatever that means), that includes two result chapters: one addressing the results of my methods, and one addressing the issues with my methods. We’ll see if “I’m back” to the blogging thing, if I ever was really “there” in the first place. I’ll keep writing, and I’ll try to do more of that writing that’s visible to the public here. 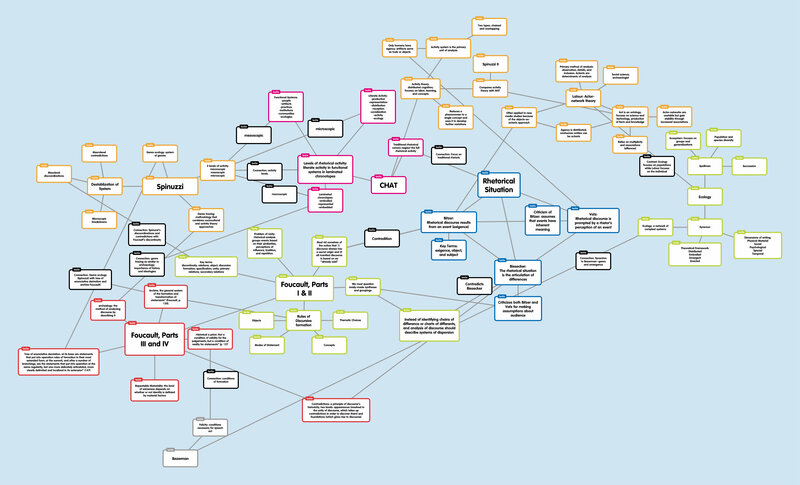 In my mind map this week, I added a primary node of Ecology with smaller nodes linking out to Spellman and Syverston (since my book didn’t come until Tuesday, I only read summaries and, thus, I need to read him before I try to add him). As a result of our discussions in class this week, I created a connecting contrast node between Spellman and Latour. I actually had a date with a biologist on Saturday who studies freshwater streams and lakes, so this was a topic of our conversation. It was interesting for me to try to explain my perception (based on our readings and discussions) that ecology focuses on groups and classification. He didn’t see it until I explained how Latour’s theory of tracing all of the messy connections to an individual helps to define that individual’s network–the result of which would not be generalizable to other individuals. For instance, a species of fish serves a role in an ecosystem–its niche–and the role could be filled by any other of the fish in that species. However, while human individuals also serve a role in their network, all of an individual’s roles within his or her own specialized network cannot be fulfilled by another individual, because we have such a high level of agency and the importance we place on social systems. I also added a primary node for Syverston and connected her concept of emergence to Bazerman, as I see a direct connection with the concept of speech acts and genres. This is a connection I plan to explore more as part of my own research. I’m in the process of reading and annotating the text I’ve selected for my spring class, and I came across what I consider a great paragraph with a great message that I want my students to grasp and understand. To me, this paragraph powerfully evokes the importance of ethos in all writing. As a web manager, I find I’ve developed an “institutional” voice that I use when writing brochure, flyer, catalog, and web copy. Each of these “genres” has slightly difference conventions, but all require the use of a trustworthy and authoritative voice. I work to develop the ethos of a school of the University of Richmond, and as both a graduate and an employee of the University, that ethos is considerable and respectable. I want to reflect my own pride in the institution through the voice I choose as a professional writer. When I teach research writing, and when I teach Critical Writing and Research I in the spring, I want to be sure that I convey the vital importance of ethos to the long-term viability and acceptance of written work. To be honest, faculty talk to one another (gasps of horror ensue), and when we do we often consider the “ethos” of specific students—would they be likely to succeed, for example, even if they have to miss a few more classes than usual for personal reasons? Their ethos, as conveyed both in their writing and in their classroom interactions, informs our conversations and assessments. As the text notes, it is students’ ethos, established in their writing, that I am most likely to remember and refer to when writing a letter of recommendation. At any rate, this paragraph spoke to me in useful and practical ways, and I want to be sure I emphasize the importance of ethos in all writing and rhetorical situations. Lunsford, A., Ruszkiewicz, J., & Walters, K. (2013). Everything’s an argument with readings, 6th ed. Boston: Bedford/St. Martin’s.